Card Text Play: Heal up to 3 damage from a creature. If you healed 3 damage, gain 1 . 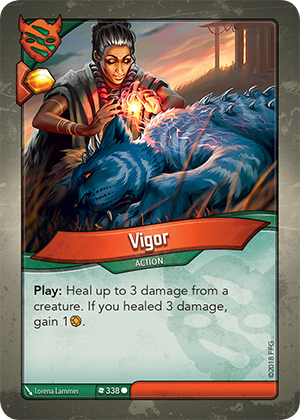 If there are no creatures in play, can I still play Vigor to gain the Æmber bonus? Can I heal fewer than 3 damage from a creature? Yes. “Up to 3” means you can choose between 0, 1, 2, or 3 damage to heal from a creature.